On Sept. 14, an anonymous allegation was covered in The New Yorker, accusing then Supreme Court Justice-elect Brett Kavanaugh of sexually assaulting a female classmate in high school. A few weeks later, the woman identified herself as Dr. Christine Blasey Ford. Ford’s allegation sparked national conversations about consent and the relevance of high school misconduct. This debate culminated when both Ford and Kavanaugh gave emotional testimonies before Congress. Despite a briefly conducted FBI investigation on the incident, Kavanaugh was confirmed to the Supreme Court on Oct 5. Not only does Kavanaugh’s behavior on the stand demonstrate that he is unfit to hold the position of Supreme Court Justice, but the national conversation surrounding Kavanaugh demonstrates the country’s lack of empathy for sexual assault victims and sets a poor example for current high schoolers. Kavanaugh has vehemently denied the allegations levied against him. Even assuming he was being truthful in these statements, Kavanaugh’s demeanor while testifying was still unacceptable behavior for a judge. Instead of handling himself with poise, Kavanaugh lost his temper. Throughout his testimony, Kavanaugh was moved to tears several times — once while talking about his calendar documentation during high school, and once while discussing his daughter’s reactions to the allegations. At one point, Kavanaugh began to furiously question the senators on their own drinking habits when questioned on his. He later apologized for his outburst. Kavanaugh is also facing several ethics complaints for his actions while testifying. People have criticized Kavanaugh’s behavior, noting that it did not reflect the high standards to which an Appellate Judge is legally held. These complaints are currently being processed by the Tenth Circuit Court of Appeals. 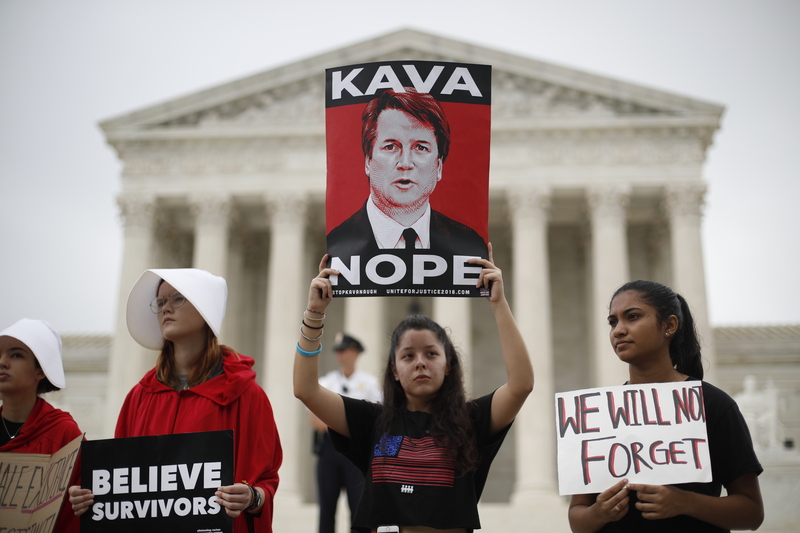 The more prominent national debate around Ford and Kavanaugh’s testimonies focus on whether an alleged sexual assault in high school should have any impact on one’s future. This debate has important implications on how sexual assault should be handled for modern-day teenagers. As high schoolers, we aren’t fully developed in our character or ability to make decisions. However, we are old enough to know the difference between right and wrong. Teens cannot be taught they can sexually assault someone without any consequences, or that they, the perpetrator, are victims when allegations of sexual misconduct arise. By approving a nominee who has credible (although uncorroborated) sexual assault allegations against him, Americans are reinforcing the idea that a person’s coming forward about a sexual assault will not change anything. Kavanaugh’s well-documented history of over-drinking as a teenager is also a warning to high school students. The conversations following the testimonies given in Congress seemed to normalize underage binge drinking, as well as use it to justify misconduct. Being blackout drunk is not an excuse to violate boundaries. Alcoholism affects the prefrontal section of the brain: the area that controls decision making and judgment. This means that drunkenness often changes actions, but not intentions. Today’s teens should be taught to be aware of themselves and the consequences of their actions. The era where men in power can escape the consequences of their actions needs to end. This Supreme Court confirmation isn’t solely affecting Kavanaugh’s generation; in 30 years, the senators that supported Kavanaugh will retire, and our country will be left with the consequences. Though we had no involvement in his appointment, Kavanaugh’s voice on the court will impact younger generations for years to come. This national conversation introduces many to the world of women. A world where Brett Kavanaugh, a man accused of assault by multiple women, can handle himself with a complete lack of grace and still receive confirmation for a life-long position. High-schoolers across the country are about to enter this new world, looking to those above them for an example on how to act. It is vital that our community, both local and national, begins to demonstrate proper actions, putting an end to both sexual assault and the ease with which perpetrators can escape the consequences of their actions.